I was born in 1960. My dad worked at the mine. We lived in Sand River. House is consumed by mother nature now. My godfather is Chuck Kelnar. We migrated to Geraladton. Dad worked there. Eventually we moved to Fort William. I will always remember that snowman. My parents are Fred and Ursula Becvar. Summers were fun there. Lots of fishing. I must be getting old cause times sure were alot simpler then. Going to have to take a trip back there and find some memories. Cheers..
After I was born, my father died in a bush plane accident in 1964, I was sent to live with my Grandfather and Grandmother Ivan (John) WOLOSHEN and my Grandmother Pearl. I was a small child I lived in Beardmore from 1964 to 1967. I remember my Grandfather taking me to the snowman and getting ice cream from the window in the summer. My mother Gladys Burke lived in Beardmore in 1950 to 52, she would have been around 20 she worked at the Delmar were she met my father who I have never known and am trying to locate. I believe his name may have been Jimmy Deitz who also worked at the Delmar and was a taxi driver as well. Any information would be a help. Hi Everyone – Going on a road trip this April 2016 from Calgary stopping off in Beardmore – I went to school a very long time ago -I lived with my grandmother M. Baldwin who was the Principal of the school and yes I remember Mrs.Dickson who was a teacher at the school. Beardmore was a great place to spend a few school years with great summers. I am looking forward to seeing this town again. Hi folks, I hope you dont mine but I am repling to my earlier blog. I arrived in Beardmore mid May on a very comfortable sunny morning thus here are some statements, thougths from my visit – some 60 years later. The ride along hwy 11 to Beardmore in my 2914 Mustang convertable was great, loved the ride on that special highway. I parked across from the Roxy – wow- it looked weather beaten but lets all remember- its the Roxy and it is still standing. I checked out where I lived with my grandmother -the small white house that once stood was located at the bottom of Douglas steeet right across from the river. From the house I walked along the road beside the river to the new rebuilt school. I spoke to a very nice lady at the front desk and was showen the wall where the pictures of all the principals hung and my grandmother was the 1st principal picture on the wall of principals – it was a great feeling. Had lunch at Anns Diner – what a cool place and had a great lunch, this tiny place soon filled up with great locals, loved the fireplace and the huge mirror hanging above the fireplace. I think I remembered a drug store beside the Roxy- it wasnt there but then again it was a long time ago that I was there. To conclude – I can now take this off my Bucket List, why did I have to go back to a place called Beardmore – those that continue to live there and those that have lived there know why Beardmore is a special place and good for us. It was a very great day. I also lived in Beardmore from about 1942-3 . My dad joined the army so we moved to Portage La Prairie. When the war ended we moved back to Beardmore. The family bought up 2 or 3 houses across the tracks behind a huge field that was directly across from the train station. I too had Mrs. Dickenson as a sub. Her daughter, Donna was my best friend. It seems we were always in trouble or at least I was and even looking back I don’t understand why. My other teacher was Miss Smith. Miss Serand was another one of my teachers. I loved her. I have many stories I could tell about my young years in Beardmore. I would be so happy to hear from anyone who lived in Beardmore during and after the war years. Beatrice: would appreciate a small amount of info on your dad’s military service – army? regiment? I’m trying to put together a list of veterans from the Lake Nipigon / Lake Superior area. I lived in Beardmore for several years in the early 1970′s. I believe my newborn daughter was about the 882nd citizen of the town. Those were great days. My mother worked there at the Delmar in 1952-53 her name was Gladys did you know her or someone named Jimmy Dietz (my poor spelling) who also worked at the Delmar and was also a taxi driver. My mother was from Portage la Praire. on canoeing on black water river, the rapids, the good old milkshakes and banana-splits, the bean – shooting, the hockey games near the public school as a school boy? and very helpful in teaching the local language to me. I have been back in the summer of 1990 with my whole family and my kids have not forgotten it, the friendliness of many people we met and the wilderness. We lived on Main street near the Hgwy 11 in a red and white home and I do remember Dave, Harvey, Melvin Rentz, the Sommers, the Doerflingers, The Mc.Kinnons, Ricky from the Del Mar Cafe and many others.,,,,,,,,,,,,,,,,,,not but least: Eddie Rentz who was the barber my mom sent me to! Hi Joe. I grew up in the town way back in the 60′s. How you described it is just as i remember. Thank you for the flash back. The one teacher i remember oh so well was Mrs Cook. Hi there. What a great post. You mention Ms. Rutherford and I wonder if we might have gone to school together. I lived in Beardmore from 1964 to 1972. My father Ralph Foster worked for Domtar and then at the post office and we lived next to the church and across from the school. I remember Jenny Fredericks, Michelle Kinkaid, the Mareks. Of course I remember the Fish Derby and many amazing visits to the lake with the sandy beaches. I recall snow shoeing across the lake as well! A small town with a sense of spirit is a great way to describe it! Someone should make this a 2015 election issue. I was born in Beardmore I lived there until August 1967 then moved to California. the main street is pretty desolate looking. your dad was our doctor when we resided in Beardmore from 1954 until 1958. My dad was a foreman at camp 54. Mr. Tansley was his boss. My mom worked as an cook at the camp too. For family reasons we went back to Germany. I have been visiting Beardmore every now and then, when I was in Canada.and might be back in the near future. I do have friends living in Ottawa ,Montreal and Toronto. Hi Juanita, Your father was the first person I saw when I came into this world! I remember your name, but dont remember you. I went to school with your sister Sandra. Your dad patched me up on a couple of different occasions! I lived in Beardmore in the sixties and moved to California in 1970. I would have started the eighth grade had I stayed there but we had to move because of my dad’s health. I knew the Goodmans Laureen and Darcy Kuzak Gary Kranz Nicola Person Marcel and Maurice Fortin. I lived on the end of a street next to the black river. Our neighbor was mrs May. I was a block away from the Beardmore Public School. Mr Rutherford was the principal and I believe that he married a ms Kirkpatrick. If any body has any information or knows any of these people or knows where they are let me know I hope to visit there soon. Hello Mr. Rutherford is my dad and he married Martine Turcotte lol not Miss Kirkpatrick. My parents still live here in Beardmore. I lived in Beardmore from 1964 to 1972. Your dad was the principal at the time and I think my mom and dad, Ralph and Zena Foster, knew your parents quite well. I recall Mrs. Fitzpatrick was my teacher … perhaps grade 1. We lived in what they called the ‘manse’ next to the church right across the street from you and the school and next to the river. Hi you Beardmore folks who showed us So much love in 1978,I was 14 years old,and My father and 2 brothers ,and 3 uncle’s had come to camp your wilderness for 14 days in a pop up camper,we came from Indiana in the USA.My family had done this many years prior to my time ,but I Love it there and 34 years later I’m starting to feel a call.Maybe a Moose hunt or some of that awesome fishing and visiting that town of Beardmore where we got our supplies,Then went sowthwest around 45 miles.Their was a waterfalls on the way to you on 11 where we took our showers.Please forgive us.lol.Any guides please contact me.Ralph Beatty Face book.Ps That swim in lake Nipigon by you all was Cold.But Beautiful.See you friends. I grew up in Geraldton but spent many a summer at Poplar Point campground on Lake Nipigon with my grandparents Harriet and Hamilton Montgomery. Grandpa was a prospector most of his life and his family lived at the Leitch Mines townsite in the 60′s. I still remember the phone number on the party line. Ring two-one. Their neighbours were the Scobie family and good friends in Beardmore were the Swearengen’s. I remember camping and fishing with all my uncles, Kent,Lee and Larry Montgomery. Very fond and happy memories. I also lived in Geraldton from 1939 until 1957. My sister Helen went to school with Kent, my brother Maurice chummed around with Lee and I knew him well at the Errington and Ashmore public between Little Long Lac mine and Townsite school at the though I was a bit younger. My parents were very close friends with your grandparents Hammy and Harriet Montgomery as my dad was a weekend prospector and worked at MacLeod CockShutt as a shift boss. Our family often went fishing with the Montgomery family. We visited your grandparents at there home either in Beardmore or at the Leitch Townsite in 1950 when I was 12 years old and Hammy took my dad, mother, brother and me underground and into one of the richest stopes where we saw “free gold” in the veins in the wall and back. It was quite and experience as it was my first time underground and I continued in mining and eventually to manufacturing and selling mining equipment. Hi I am looking for anyone who knew my mother Gladys who worked at the Delmar in 1952 any info would help. Went to school at Leitch Gold Mine one room school, 1946-1950, Beardmore Public school 1950-1952. Lived at Leitch Gold Mine Old Townsite. Moved to North Cobalt, On fall 1952, lived on Hwy 11 just south of Haileybury town limits. Our house, a prefab cottage is still there. My family lived in Beardmore from 1949, until I moved to Thunder Bay in 1977. I have been back to the Beardmore/Jellicoe area every summer since then. I spent all my early childhood camping during the summers at Lake Nipigon. What a gorgeous lake. 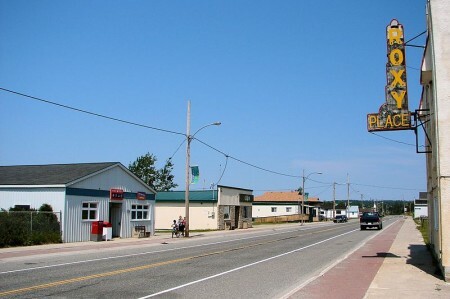 Growing up in Beardmore was great…..we always had something to do and friends to hang out with. I went back curling in 2013 and there was 6 of us together that started Beardmore Public School in Grade 1 in 1954…..Mrs. Dickison was the teacher. Very fond memories of that old town. I was born in jellicoe and raised in beardmore. Going back a lot of years..1940′s. My mom and dad had a restaurant and have many good memories of growing up there. We left in 1949. If anyone remembers the Fund’s please contact me. Falls??? I live in Brantford. I went down to Beardmore on the Sunday after the reunion. grocery store is still there and operated as such. Sure would be great to here from you. I lived in Beardmore from 1941 to 1948 minus 1 year to be in Man. during the war. My teachers were Miss Smith, sometimes Mrs. Dickenson & dear Miss Serand (don’t know if I spelt that right but she would forgive me. The kids I remember were Donna Dickenson, Doloris, Eddy, David, Joseph & Joy Thorenstiensen, Bernarads (lots of kids), Gary Keatly, Alice Cooney Trudy Fuze and more who I have seen on Facebook, . I am now 80 years old living in Calgary, Alberta. I spent my summers in Beardmore in the 1970′s. My grandparents were Ed & Emma Rentz & grandpa owned the Barber Shop on main street. Lots of great memories from the drive & my stay there. I have had the life long privledge of growing up as a summer resident my father came to Beardmore in 1949, and made many lifelong friends as did both my sisters Kathy and Jody. Nothing like seeing the town and the lake for the first time of the year, and the bummer to leave in late aug. here we come buds, rock on!!!!!!!! I grew up in Beardmore in the ’50′s. My family moved to Geraldton in 1963. My brother and I attended Beardmore Public School and we spent mega time at the curling club and skating rink and Lake Nipigon and the baseball fields in the summer. My parents were Nick and Trilby Kozak and my brother was Calvin Kozak. They have all passed away and my memories turn to Beardmore often. I lived in Beardmore in the early 60′s. My parents are Ed and Lil Dupont. My dad owned “Ed’s Esso” for a while, then our house burned down beside the station. My sisters are Cathy and Gail Dupont, my brother is Lorne. I have some fabulous 8mm home movies from back then, and from Geraldton. I remember the esso gas station. He had a lot of old cars on the side of the station i guess for spare parts. In the winter sometimes we would play in the cars half buried in the snow. I’m looking for some of the people that I went to school with . I’m hoping to get up there either this year or next so I’m trying to make contact with some of them. it has old and new pic’s and people whom you may remember……. Just found this site … love it. I too also grew up in Beardmore, left for the military in 1980. I have been back afew times. this July 2013 family reunion for the Leroux/Ladouceurs/McCrady’s … see you all down at the Lake this summer. Jazz. I went to breadmore public school. May have played with the same kids. Give me a email and perhaps we did. Moved to kitchener On. In 1966. Adriano Squissato!! It’s Maria Franzoi! How are you? I happened to google Beardmore Ontario and was thrilled to see this site. I think John Maurina is a bit confused. You couldn’t be Julianno’s friend if you’re my age!! Lol. He must have you confused with Germano. Wow so many good memories of Beardmore. My son and I are thinking of going up there real soon. I brought the girls up there years ago but he’s never been. I’m afraid that he’ll never want to leave though because he’s really into fishing these days. How’s the family? How many times are you a Nonno? Three times for me. So far. God Bless Beardmore and everyone still living there! I grew up in Beardmore. I used to live right across the road from the Snowman. It would scare me as a kid – with that big grin over the street lamp!!!! Ahhh, memories. Loved the fish derby – always brought lots of people in to little ‘ole Beardmore. The legion became a “hoppin’” place during the Derby. And the fish!!!!!!!!!!! Gynormous!!!!! I used too live in beardmore as a kid. My parents are Ray and Jeannette Faubert. I have aunts and uncles still their. The brunet\\\’s and Lafontaine\\\’s. In the early nineteen eighties I worked for the Ontario MNR. Often drove to Beardmore. Loved the drive from there to Nipgon. But I will never forget the wisom on the bathroom wall: “For excitemÎnt in Beardmore, people sit on the curb and wath the pavment crack” I dream about living in such a time and place once again. Hi Liesje, I found this site by accident and came across your post of over a year ago. I too went to St Theresa’s school. We moved out in May of 1965. I am from the Lacitalio family you refer to (slightly misspelled, but close enough). I remember you well, and I’d love to hear from you. Did you happen to know my mother, Miss Dianne Salem? She taught at St. Theresa’s school in the 60s. Do I remember Miss Salem? Does Crayola make crayons? Of course I do! She taught me in grades one and two in 1960-62. The kids looked forward to being selected by her to choose books from the truck that came to our school periodically to stock the mini library at the back of the classroom. She was very young and energetic. 1960 was my first year of school and I believe it was her first year teaching. I also vaguely remember a small shop in town called Salem’s. Very, very fond memories. I hope she’d doing well. My mom would have the biggest smile reading your blog and so a heart felt thanks for sharing your memories! Sadly she passed in 2002. You are correct about Salem’s Store. My grandfather sold things like hambugers, cigarettes and candy. I have a few informal pictures of my mom’s classes, one of which is dated 1962. The kids are dressed up for Halloween and looking so happy! Thank you for your reply, Linda. I’m sure there are many others who have fond memories of her. Wow! You definitely have the right Laccitiello. Good to hear from you. I certainly remember the shared garage. I remember your Dad as being a kidder and your mom as a caring, generous person. My parents exchanged Christmas greetings with them until the end. I have a framed picture of Mickey with myself when I was three or four. I remember the model train set. Yes, we moved to Montreal in 1965 and still reside there. I believe you are in the Fraser Lake, BC area. If you ever plan to come to Montreal be sure to give me a shout. Hi Werner, I lived down the road from you in Leech, my brother, Jim, and I stayed at your place a couple of times, and have the fondest memories. Have loved Eiderdown quilts ever since!!! I hope you are well! i went to beardmore school in the 1960 s my name is Simone, I have so good souvenirs, if anyone remember me, you are more than welcome to send me a e-mail. I used to live in Beardmore in 1978 with my parents. Their names were Richard and Ina Payea.There was us 4 daughters too. Nancy, Judy, Charlene and Cheryl. We live on a back street near the Snowman on the right down from Fontiens. The house the Jim Nails owned.Anyway was wondering if the property on bush lake was still there in my fathers name or it might be fenced off, Tange Bailey owned it and gave the lot to my father ,was wondering and maybe if it is I wa sgoing to move there. anyone with info. please e-mail back please. I just found this site. I am originally from Beardmore too and wanted to respond to Liesje posts. My uncles are Billy, Johnny and David Ladouceur. I am not too sure who you are, so email me with more details. Remember Banmens, Dicks, Sinclairs, Lacitalio, McKarskys, McKays, Mrs Brown, Mr White and Mr VanWeirengen Remy the bus driver Billy, Johnny and David Ladoucer’s. Looking to hear from anyone. My dad worked at Leitch Gold Mines as a welder. Hey I lived there in the 60s also do you remember all of the Goodmans. I’m looking for a canadian fishing guide who happens to guide on lake nipigon. I only have the name of his boat, which is ,I believe to be called the JESSIE JAMES. He is a commercial fisherman as well as a sport fishing guide. I need to contact him about possibly booking a brook trout trip, for next year. Any information, on how to contact this person will be greatly appreciated. Or if this guide has a web sight or an E-mail address. I went to school in Beardmore in the 1960′s. It was a quiet small town at the time. Many happy memories.